The MatrixALM solution helps your team build products with less stress. 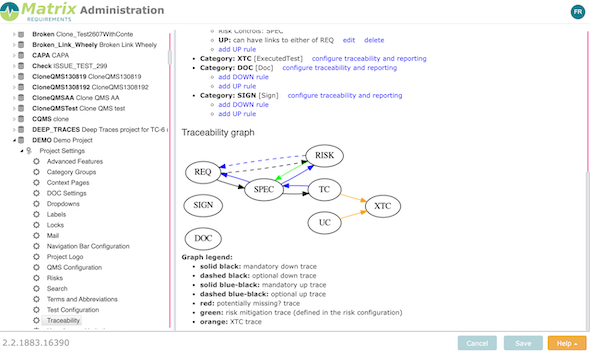 Instead of writing big Word documents and trying to maintain Excel files for traceability and risks, MatrixALM allows you to update user and system requirements. Also technical specifications, tests, test results, risks and every else you need to document for your design, can be created in an agile way. 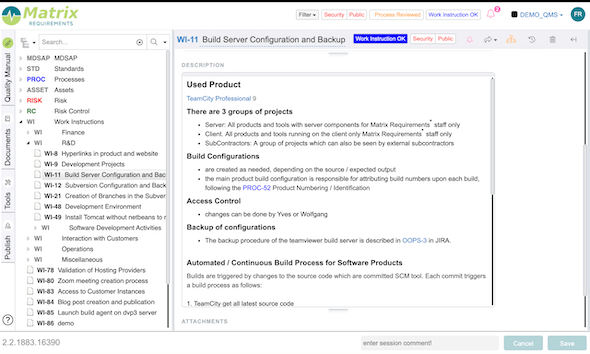 Let your whole team participate and benefit from up-to-date documentation! MatrixALM allows you to define any number of layers of requirements, which define the design input and output. It helps in verifying that the traceability is correct and complete. 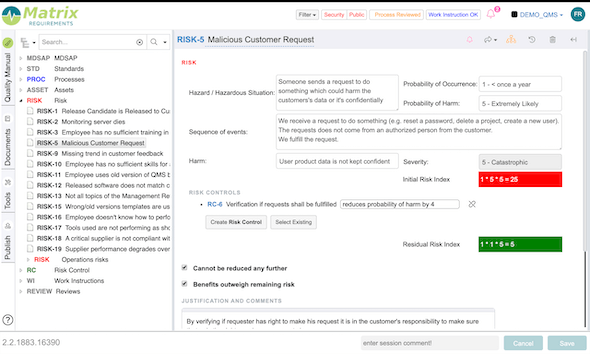 The Risk Module allows you to design forms to enter the risks you need to document according to ISO14971. You can customize the forms and formulas according to your procedures and hazard analysis. Risk controls directly act as design input. Verification and validation tests can be defined for any layer of requirements. 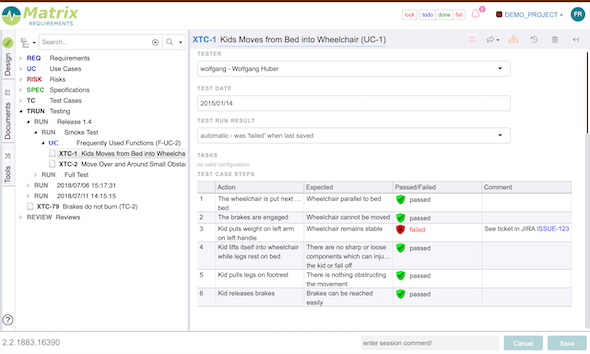 Test scripts can include other tests and run external tools to collect automated test results. 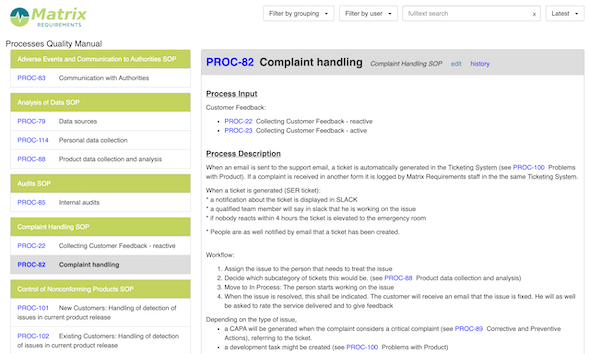 If a test step fails it can be linked to any external ticketing system like JIRA. From the database stored design input and output you can create documents which render the data as you need it. It can dynamically include anything from simple requirements to complex trace tables. Documents can be electronically signed whenever you reach a milestone. 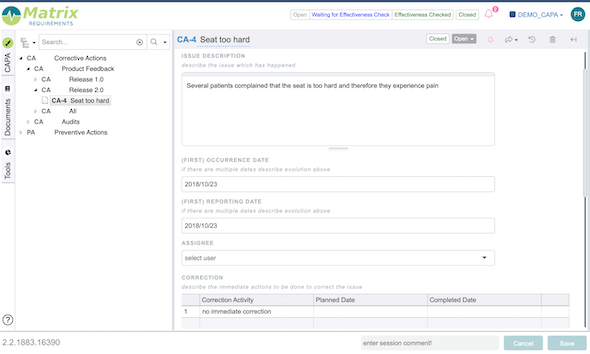 No two medical device projects are the same, so we make it easy to add layers, input fields and traceability rules. The MatrixQMS solution helps your team build a great quality system. 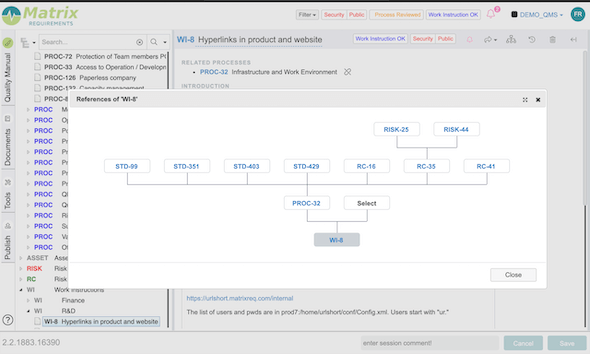 The key difference is that MatrixQMS provides realtime tools to bridge the gap between the team and the quality department. MatrixQMS allows you to add your own specific standards besides ISO13485, ISO27001 and others, which come with the system. 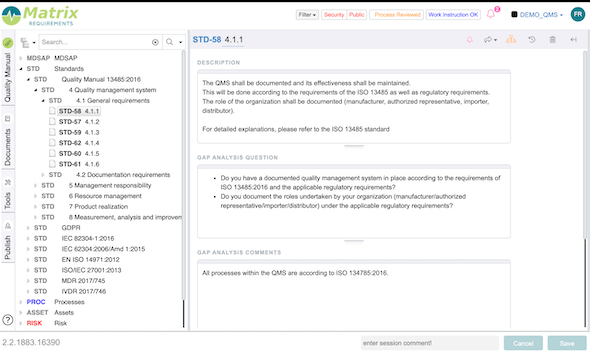 These make it easier to develop your processes and create a gap analysis against the regulatory standards. In this section you define all required processes directly linked to the requirements in the standards. Keep them small and simple so that you and the auditor can understand them. If you are just starting to build your quality system you can kickstart it with our library of typically required processes. When you use ISO 13485:2016 you now need to do a risk analysis for your processes. This is easy, fast and efficiently achieved with the integrated Risk Module. Work Instructions is the place where are all your technical details for a process are recorded. These can be updated quickly to keep everything and everyone working effectively. An integrated CAPA project allows you to log corrective and preventive actions and link them to the tasks in your issue tracking software. Matrix will take care of the traceability in your QMS and automatically build an audit log with each change. A rigorous review process is integrated in MatrixQMS, to ensure no procedure or work instruction is published unless it's been approved. When all the processes are approved, the QMS can be published to the team to make it easily accessible for everyone. The published view is streamlined to allow anyone in the company to find the procedures and work instructions that (s)he needs to use. This video shows the basic principle of MatrixQMS. This video shows how items can be organized in a tree structure and links to these items can be embedded into documents or email. 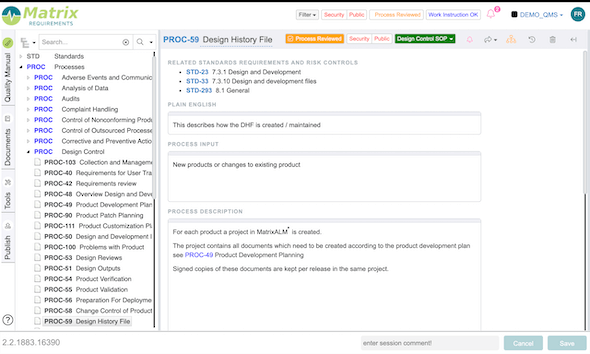 You can see how requirements are created and linked to specifications. It shows how risks can be defined and linked to mitigations. 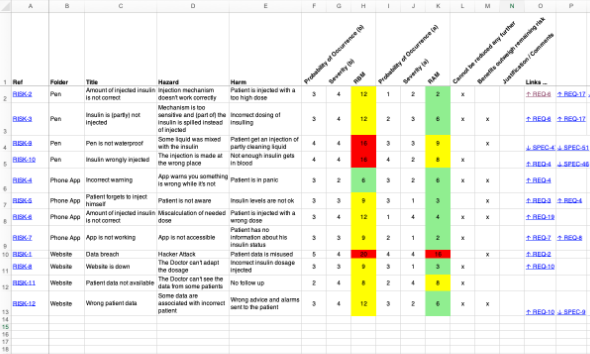 It also covers some design and risk analysis reports. This video shows how design input and output is connected and how you can navigate in the project. You can learn how the software indicates when traces or items are missing or are out of date and how to inform your team. It also shows examples of reports that help you to verify and document the traceability. Learn how to select which items to include in reports and choose whether to create it as HTML, Word or PDF. See some examples of the default reports that can be generated: to document the design, create test instructions and document test results. Perform a risk analysis and traceability analysis report and finally learn how to prepare and record design reviews. This video shows how every change creates a new version of the item. It shows how to look at and restore previous versions of the same item and where the revision number of a version shows up in reports. It explains the concept of session comments which allow you to use the same comment for multiple changes rather than entering a new comment for every single change. 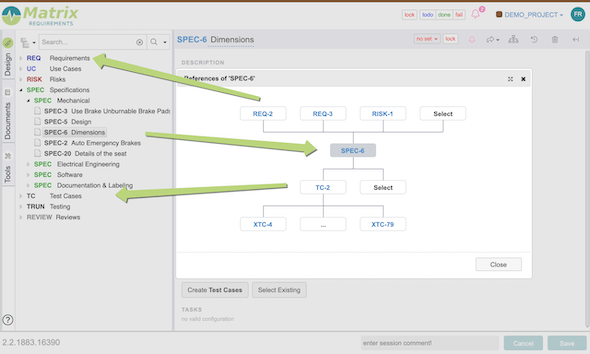 This video explains how to define test cases and how they can be run in multiple test cycles. Learn how to enter the test results directly into the software and how to create reports with the test results. 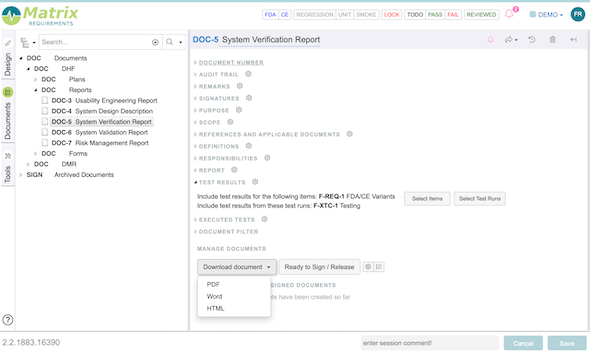 It also shows the reports you can create to print test instructions and to verify that the test cases cover all requirements and risks.